Today we are going to be reviewing the MoonyBaby Video Baby Monitor, including all of the best features and good points, as well as a few of the negatives. After all, when it comes to caring for your baby, you want to know that you have the best monitor possible, and it is always a good idea to shop around and see what other people are buying. This baby monitor just happens to be one of the most popular on the market. Take a few minutes to read our review to see if we agree on this opinion. The MoonyBaby Video Baby Monitor is designed with 100 percent wireless, secured technology that ensures your privacy, with a secure connection between the monitor and camera. It has a 2.4Ghz signal that is free of interference, and can work between upstairs and downstairs. You do not need to be online and have an internet connection to use this monitor.There is a two-way, talk-back feature that lets you talk to your baby or your partner when you are not in the room. It has extra-long battery life, with 12 hours in the power-saving mode, and six hours in continuous video on mode. You can zoom in for closer views, and the universal joint design lets you mount the camera in most positions for optimal viewing. We love that this baby monitor from MoonyBaby has a large, 4.3” LCD full color monitor with night vision. There is nearly 1,000 feet of coverage, and you can zoom in to get a good look at everything that is going on in the room. You don’t even have to be in the room to talk to your baby with the MoonyBaby monitor, because there is the two-way talk-back feature. If you need to soothe your baby, or even talk to your partner, you can without having to enter the room.There is one thing that we aren’t happy about with this baby monitor though, and that is that the battery life isn’t always as good as the manufacturer claims. If you do decide to purchase this monitor, you may want to look into a backup battery, just in case.There have also been instances of some of these monitors either arriving broken, or breaking within a few weeks of use. But, these issues seem to be few and far between, and from what we can tell, there is great customer service if you should have any issues. When compared with other baby monitors, this model from MoonyBaby fares pretty well. Again, we love the large screen, whereas many other baby monitors have screens measuring less than three inches. Also, other baby monitors require you to be able to connect to the internet, and that is not necessary with this one.For the price, you are going to be getting a lot of features that you aren’t likely to find in many other baby monitors. For instance, this monitor from MoonyBaby has a temperature monitoring feature. It continuously monitors the room temperature, and alerts you if the room is too hot or too cold. This means your baby will always be comfortable while sleeping.On the other hand, there are features offered with other baby monitors that aren’t found in this model from MoonyBaby. For instance, other baby monitors have recording features, so you can play back recordings from throughout the night and see what your baby does while you are sleeping. This can be particularly handy if your baby is at an age where they are starting to try and climb out of the crib. You will know what is happening, and can take steps to prevent accidents. All in all, if you are in the market for a new baby monitor, this MoonyBaby monitor is a great choice. At a price of around $75, it is reasonable when compared to other baby monitors, and it has a lot of features that make it worth the price. 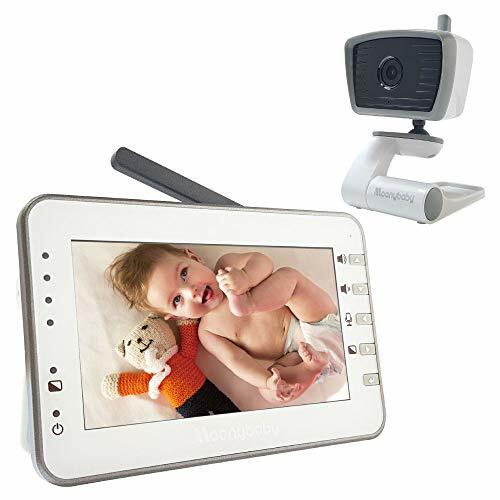 The large LCD screen has excellent video quality, and it is color, not to mention the fact that there is also excellent night vision so you can see in low lighting conditions.Having a baby monitor in your home can mean the difference between life and death in some cases, and at the very least, you will always know whether your baby is sleeping or awake, and if they need you. It is going to give you that extra peace of mind you need, so you can get a good night’s sleep yourself. The MoonyBaby Video Baby Monitor is that peace of mind, and that alone is worth the price. It is available for on Amazon, and can be delivered to your home within a few days of ordering.